Includes aluminum pole & mounting bracket for instant setup. Mounting bracket has adjustable angle ranging from 0° to 90°. Nylon flag will stand up to strong winds & poor weather conditions. This welcome flag is meant for positioning outside of a business, store or residence to welcome individuals entering a building. 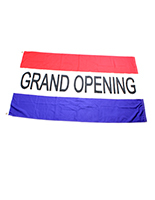 The 5'2"w x 3'h banner, welcome flag is comprised of (1) nylon flag, (1) aluminum flagpole and an adjustable bracket. 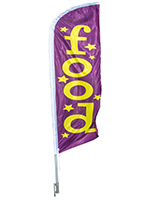 We even provide the welcome flag with (4) screws for easily mounting the outdoor banner to almost any surface. 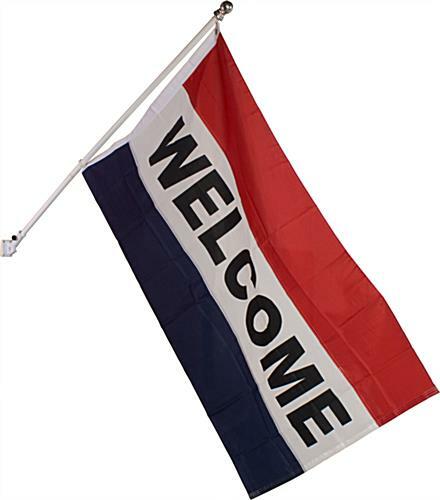 This welcome flag, such as most message flags, features a red, white and blue striped color scheme, a standard design with which customers are familiar. 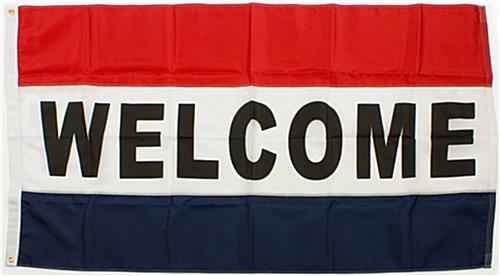 The welcome flag includes an adjustable wall bracket for changing the angle of your displayed message flag. In fact, the bracket easily adjusts from 0° to 90° in seconds! This outdoor banner kit, welcome flag has (2) brass grommets for fastening its message flag to the aluminum pole's metal clips. We provide the welcome flag pole with a 1/4" diameter washer to keep your welcome banner securely attached to the pole. The welcome flag, also known as a message flag kit, has a flag measuring 5'2"w x 3'h making it an ideal size for positioning near a roadway or within an outdoor strip mall. 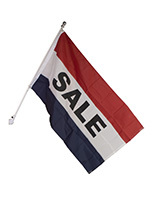 The flag itself will draw attention towards your business, yet won't overshadow other advertisements or company logos.